To build sustainable innovation capability, organisations must focus on building a culture of innovation. Unfortunately, while the destination and catalyst for developing innovation capability and building a culture of innovation is now clearer than ever, the starting point is not. To use the ‘sat nav’ analogy, if you don’t know where you are then you can’t plot a roadmap to your chosen destination. The challenge facing many organisations is a lack of clarity on the internal barriers to innovation, whether they be leadership sponsorship, management approaches to innovation, communication about innovation strategy or lack of process and tools. Building a culture of innovation is an organisation-wide endeavor and requires a multi-disciplinary approach, an ecosystem to survive and the right conditions to thrive. That means the innovation audit has become a vital tool in understanding an organisations current state of innovation readiness. 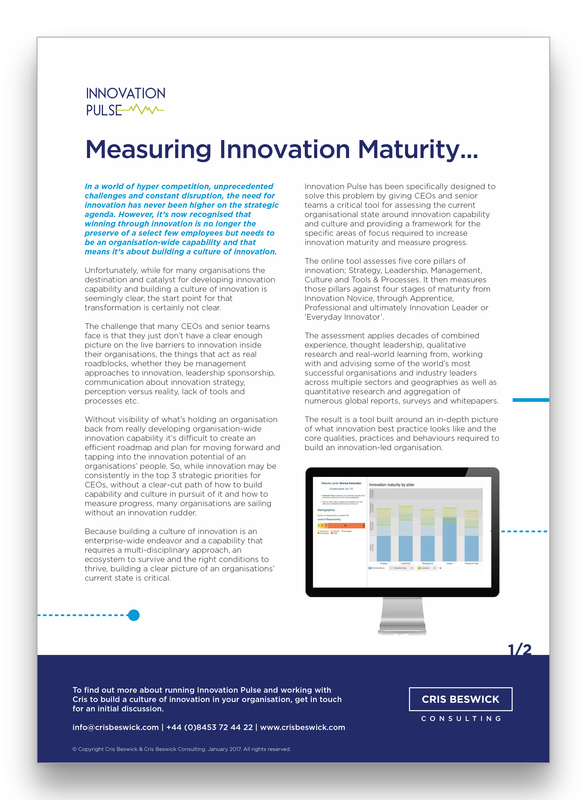 The innovation maturity assessment is a starting point for understanding where your organisation is today and where to focus to develop your innovation capability and ultimately, build a culture of innovation. It measures 5 key pillars; strategy, leadership, management, culture and process. Delivering cross-department and cross-organisation comparisons the unique tool cuts through assumptions, enabling leadership teams to formulate an innovation culture development plan based on the true, current state of innovation readiness. The maturity assessment has been developed from extensive qualitative and quantitative research that not only benchmarks individual organisations but also incorporates an aggregation of national and global innovation reports and studies delivered by global consultancies, thought leaders, businesses, academics and researchers. The research has also been combined with practical development work undertaken in a wide range of business sectors across the globe to ascertain both the generic ingredients and core components for building a culture of everyday innovation. The Innovation Maturity Assessment is a powerful weapon in the armoury of CEOs, senior leaders, HR Directors and Transformation Leads who want to develop a strategic and pragmatic plan for placing innovation at the core of their business. Want to assess your organisation? Get in touch.